This post may contain affiliate links. I like to share weather gathering instruments and stations, that may help you with your weather interests. These links do provide a small compensation to me, that helps in daily operating costs of this site. So I received the La Crosse V40-Pro weather station for a Christmas present. What a terrific gift! It works out perfect as I didn’t own this particular model from La Crosse. So it was exciting to get going with checking out all of its features. With this model, I have found that there are several things that I personally get excited about. I will bring all of these great things I like in the review as you read on. La Crosse Scientific Technologies has hit a home run with this model. This unit provides wind speed, wind direction, precipitation amounts, and a 12 and 24-hour future cast. I love the future forecast part of the display unit. The display is a brilliantly colored display. It is very eye-catching, and easily seen both during the day as well as the night. The remote monitoring weather station features wind, rain, indoor and outdoor temperature and humidity data, daily high and low temperature records, dynamic forecast icons, and a new Wi-Fi connected option. This option will allow you to see all of your sensor data in the new La Crosse View app. I probably spent a total of ten minutes getting the app set up on my iOS phone. I also probably spent 20-25 minutes, researching and setting up my weather station to Weather Underground. It is now giving the Weather Underground community constantly, updated weather data from where I live. You may see it by going to this link, George’s Weather Underground. Please see the video on using the La Crosse View app below in the manufacturers support heading. The video explains very well how to set the app up. LTV-TH3 Sensor: This sensor is the small temperature/humidity sensor. 2 “AA” alkaline batteries are needed. The display is a color display. It can be seen very well at most times of the day and night. However, if the sun is shining into your room, I have found it to be very hard to see the screen. Too much light you know! However probably over 95% of the time, it is not very difficult to view and see everything displayed so nicely and clearly. Be aware of two things that aren’t that obvious to a newer person. On the top of the larger remote sensor, the one with the rain gauge, please notice there are small engraved polar dierctions for North, South, East, and West marked for you to use. There is also a small bubble level gauge for you so so may use it when setting up your rain gauge level as directed. The screws for all of the set up are packed in the bottom of the displays power cord box. The power cord is approximately 70 inches. I believe when you plan to plug it into your power’s outlet, then plan to hang it loosely at probably 66 inches maximum distance. You will be doing well if you plan that 66 inches is the length you are going to need to be under. Remember the display unit should have 3 “AA” batteries inserted in the back of it as a backup power supply. Another tip pertaining to powering up is to be noted that the power cord area of attachment, is small and not seen easily at first glance. So you will please notice on my provided picture where the cord attaches to the back of the display unit. The type of instruments that are provided is the following. These are outdoor readings. These are all the instruments that collect data for you from your remote sensors outside where you live. The sensors have the following dimensions. This will give you an idea of the size that they are. The indoor readings provided for you are the temperature currently in the room where your display is as well as the relative humidity indoors. It also gives you the current time, the date and month, what day of the week it is as well as, plus the current year. The transmissions are wireless and the connections all use Wi-Fi. My current personal range is at around 100 feet. I can vouch for it working well at that distance. The app will be sending constantly updated weather data to your mobile telephone, or i-pad etc. It will send you new weather data and this includes any alerts you have set up. A note of worthy attention: Please be aware that the La Crosse View App is a limited 24-hour period for data and it stores a weeks worth of rolling data. If you are expecting to have access to a lot of history and data beyond a 24-hour period and a week’s worth of collected data, please beware of the fact that the View App will cost you some money per month for a more historical data collection. Please see my screenshot of the La Crosse View app page. You will see the current subscriptions that are available for purchase. So here are a few things that the app will present to you. These are free to a point of time as I explained and showed you in the screenshot. Alerts that are available are indoor temperature alerts for both high reading and low reading. Ditto for inside relative humidity as well. Also I set up alerts for both outdoor high and low temps, and high and low relative humidity readings. If you are using alerts because you are a gardener or a farmer. Alerts can be very handy to have to prevent crop failure for you. The app will also set up the time and date to National Institute of Standards and Technology times with Wi-Fi connection. The latter part of this video covers setting up the La Crosse View App on your mobile device. In fact, I thought it covers how to set it up very well. ✅ Temp and relative humidity readings are very accurate. ✅ The forecast icons are very colorful and the seasonal trees background changes every 3 months to cover the four seasons. The forecast seems to be right in line with what is coming up. No discrepancies here on that. which may be used for limited mounting choices. But many consumers will have need of a more extensive mounting pole to extend to greater heights for their mounting location. ❌ Did not see the tiny pressed white N S E W symbols on the top of the remote sensor. You have to dig in the manual to see a mention of them. ❌ Hard to see the screen on display with sunshine coming into room during the daylight and especially bright sunshine. ❌ The rain gauge is very touchy. For many customers it has been a problem. It must be level when setting up. You will need to be very specific in following the directions for the gauge. They do have a piece of very thorough testing information on the rain gauge to help you out. This is the top end of the middle range for lower-priced value-added weather stations. Let me explain. Many weather stations fall in the $35-$75 dollar range. These are what I would term value-priced, beginner weather stations. They are offered to beginners and lower interested but STILL Interested in, weather folks. When you start out, you are “interested”, but probably not “$125-$200 interested” in weather. So you will spend the $35-$75 to get a value personal weather station, but the unit you buy will not be that expansive in the weather data it presents to you. 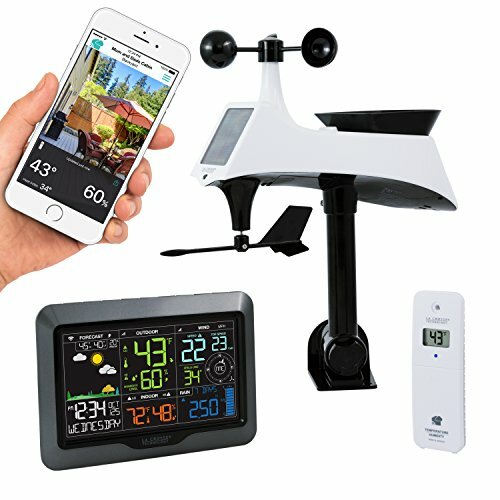 So as I look at the La Crosse V40-Pro Weather station I see a fairly priced, upper ended value, personal weather station. I believe it would be very hard to come across any other weather station that will give you this many weather readings and data, from this price point. As you check around I am sure that you will be hard pressed to find the accuracy in the data provided and the number of sensors that provide that data at this low of a price. In looking at what customers see, the majority of consumers have recognized the value for the price in owning the La Crosse V40-Pro Weather equipment. I have been impressed and am a proud owner of this station. Remember you may check out my other page on what’s inside the box when you purchase the V40-Pro from La Crosse. This article may be found at The Unboxing of the La Crosse V-40-Pro Weather Station-a Remote Monitoring Station. What will you find in the unboxing of the La Crosse V-40-Pro weather station is gone over step by step. The La Crosse V40 Pro Weather station is a complete weather instrument kit. When opened I walk you through the weather station from my personal view. A detailed list of features and Pro and Cons are provided. © 2019 GeorgeLovesWeather.com. All Rights Reserved.